Posted by Argos. June 5th 2014. 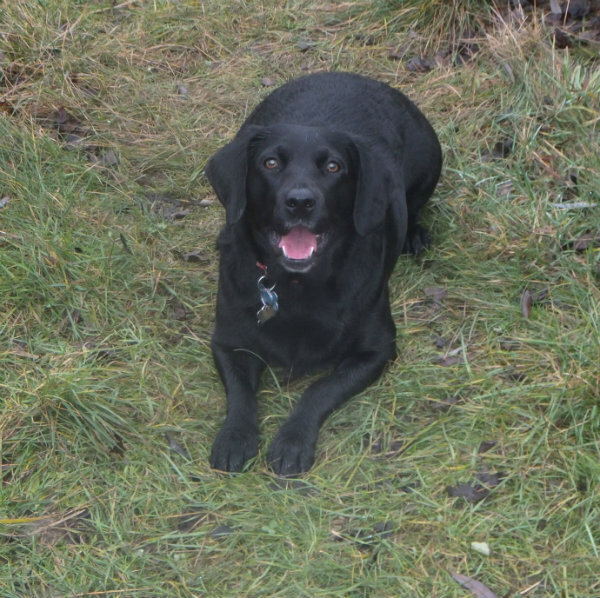 Read the heart-warming story of Mr Jury’s life with his companion, Abby, a beautiful Springador. Mr Jury experienced first-hand our top quality service and reassurance from our customer advisers. 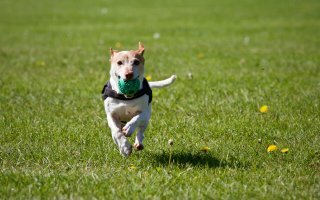 Learn the real-life benefits of insuring your pets with Argos Pet Insurance. I am more than happy to tell you the story of Abby, my five year old Springer-cross-Labrador… a breed better known as the Springador. Before Abby came into my life, I had been ill with depression for over a year; I was not in a very good place. My wife, Angie, suggested getting a dog to try and give me a real interest. I saw an advert in a newspaper for Springadors for sale. I had never heard of this breed of dog before, so I contacted the breeder. We were able to see the mother and father, both of whom were very impressive looking. Abby was the last one of the litter left and as soon as I saw her, that was it – love at first sight! She came home with us that day and the fun began. I spent four weeks working on her recall in the garden. Straight away I thought “wow – this dog learns quick!”, and she did. By the end of the first week, she was house trained. Because of my illness, I hadn’t been leaving my home and had retired from work on health grounds. I started walking her outside at twelve weeks of age, after her injections. The furthest I could manage was to a local park a couple of minutes away from where we lived. We went to training classes which were great fun and I was amazed at how quickly she could pick things up. Of course, I now know that I was the one who was being trained, not her. I could already walk her off her lead and have been able to do so ever since. Slowly but surely, my health improved; the walks became longer and we gradually ventured into far more interesting places. Abby became very ball orientated. She is a very strong swimmer and loves to swim under water – she really scared me the first time she did that! Of course, we had all the usual puppy problems that dog owners go through; a little bit of chewing at skirting boards etc., but she never destroyed anything. I think all dog owners can tell so many different stories about their dogs, and I am just the same; the laughs, the worries – like the time we were both chased and stung by wasps after she disturbed the nest, resulting in a visit to the vet’s – but everything has been so much fun with her. She travels with me everywhere I go. By now, Abby and I were having long days at the seaside or strolling in the woods. I think Abby was around three and a half years old when I first saw her limp slightly. The next day she seemed OK, so I put it down to her maybe straining something. Three months later, she started to limp again; this time it was more pronounced, so it was straight to the vets, who prescribed anti-inflammatory medication and lead walking. “Lead walking? What a joke!” I thought. She seemed to recover after a couple of weeks and away we went again. Unfortunately, the problem kept returning. When examined, X-rays didn’t really show a lot. Abby didn’t show any pain no matter which way her legs were pulled, but the vet thought there might be a problem in her shoulder; how wrong he was! After many vet visits, Abby was eventually referred to a specialist in Doncaster who has a very good reputation in the area. A CAT scan was suggested. Both of her front legs were scanned and then we had to wait a long four weeks for the results. I will always remember the day we went for the results. I thought there would perhaps be a problem in one joint, but no – the scan showed different problems in all joints of her front legs except for the shoulders. The specialist explained that there was nothing he could really do. She has extra bone growth in four joints, other joints have geodes in the bone, her right front elbow joint has a hairline crack going into the bone and all the joints in the front legs are affected to varying degrees of arthritis; her left paw is the worst, being described as severe. Devastated isn’t the word for how I felt. I was told the problems could have been hereditary, or caused or aggravated by the impact of jumping and turning sharply when chasing a ball. Of course I will never really know. On the journey home, I felt in a daze. Her treatment is a daily EFA tablet to help the joints and Onsior tablets for when she is limping. She has been on these tablets for about five months now. Her exercise was cut right back and then slowly built up again. A diet to make her lose excess fat was also encouraged and she is on the James Wellbeloved Light with a little white fish added in. A course of hydrotherapy has also helped; the first ten sessions being paid for by the insurance company. We can now go for walks again for up to two hours without any ill effects; however, ball chasing has been cut back. I intend to keep her going to hydrotherapy indefinitely at my own cost, but am so thankful to Argos Pet Insurance for giving us the means to discover how much help this would be to Abby. Unfortunately, I have not worked since my medical retirement and the cost of Abby’s treatment to date has been: £220 for the x-rays, £1,400 for the CAT scan and the tablets at £58 a box for the anti-inflammatory and £98 a box for the EFA tablets, which are an ongoing cost. I estimate the total cost to date of her treatment at over £2,000 and rising. Without Argos Pet Insurance, I would not have been able to find out what was wrong with Abby and then afford the medication necessary to make her life as good as it is right now. Through the insurance I am able to make her quality of life as good as she made mine when she joined our family. People say that insurance companies try to wriggle out of paying for treatments but I can honestly say that Argos Pet Insurance paid for everything I claimed for without question. They paid the money straight to the vet or specialist, which meant I didn’t have to find it, and wait for reimbursement. Whenever I have contacted them, they have been very helpful, polite and efficient. Not having to think about the cost of treating Abby has been wonderful at such a worrying time. I can’t thank them enough. I am sure my story is just one of many out there, but I would say to anyone – it makes sense to insure your pets! And I can honestly recommend Argos for dog insurance.